Built 1936-1937 as "Teatr opery i baleta im. Spendiarova" after plans by Alexander Tamanyan. 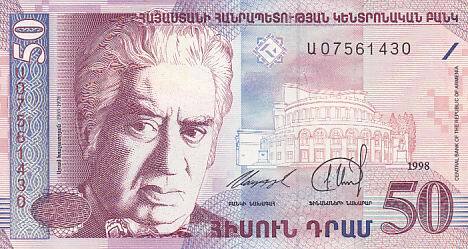 Named in honour of the Armenian composer, Alexander Afanasii Spendiaryan (1871-1928). 1978-1980 major renovation. 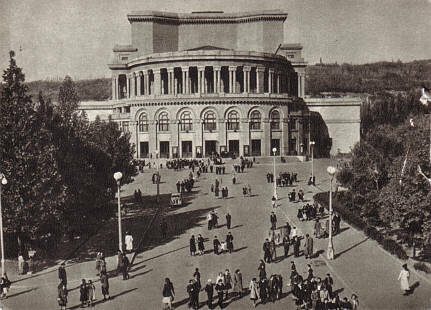 Currently used as concert hall "Khachaturian Hall", named in honour of the Armenian composer, Aram Khachaturian (1903-1978). 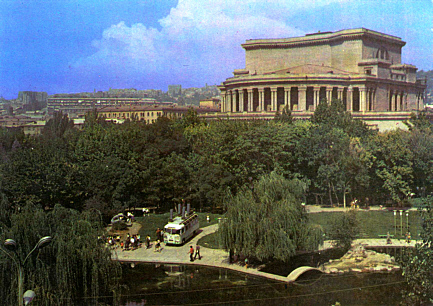 Home to the Armenian Philharmonic Orchestra. 1300 seats. Reverse Text: "Armyanskaya SSR - Erevan - Teatr opery i baleta im. Spendiarova"
Publisher: Iskva revolyuzii, Moskva; 2958; III03995; 17/IX-54 r.
Reverse Text: "Yerevan, Akademichesky teatr opery i baleta imeni A. A. Spenidarova"